The Republic of South Sudan is the youngest country to achieve sovereignty and got its independence in 2011. This young country is in a political crisis which has forced thousands of people to escape to other areas in search for peace and better social services. The crisis has delayed development all sectors but it is mainly the education sector which faces huge challenges. Over 1.3 million primary school children are out of school, there are inadequate school infrastructures, lack of trained and qualified teachers as most of the South Sudanese graduates tend to seek job opportunities outside South Sudan where it is safe and secure. There is a strong need for support for the education sector, there are numerous international NGOs undertaking that responsibility but it’s still not enough, more educational projects need to be established to improve the lives of the learners in schools. In February 2014 the Foundation launched the DU program in the country in collaboration with its partner AVSI Foundation to give its contribution to the local situation of crisis. With AVSI a joint educational project was launched to accompany young people and adults towards a better future. The activity is implemented through a partnership with the Catholic Church in the cities of Torit and Juba, where thanks to the close work with the local Dioceses, was possible to set-up 5 informatics centers. Moreover, since the education system of the two cities is gradually improving the need of introducing specific informatics courses was highly demanded by the local communities. 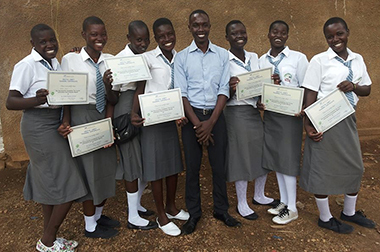 The activity carried out in the country was so appreciated that in 2017 the DU program received an international recognition in Torit when over 50 employees of the UNIMISS (United Nations Mission in South Sudan) attended the courses organized locally and were then awarded with DU certificates. 2018 is also progressing extremely well and as of September, we trained over 6,500 people since the beginning of the activities in our 5 centers.